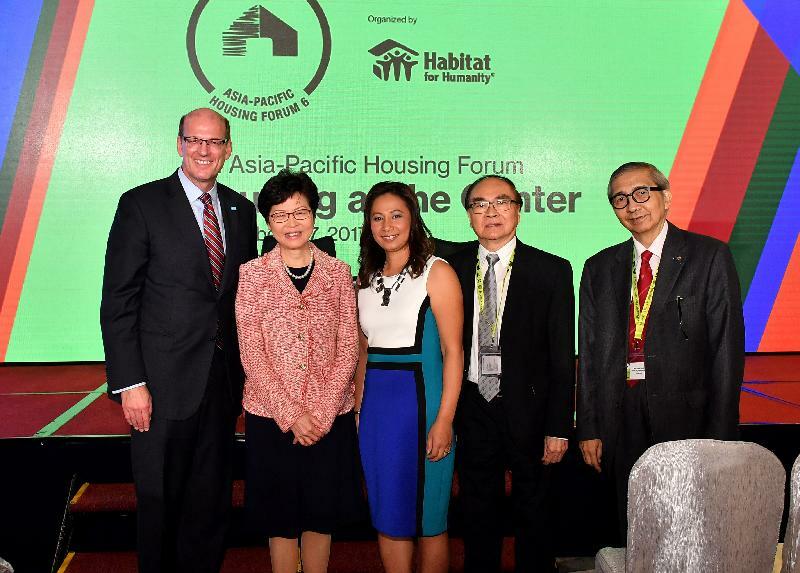 Today, it gives me great pleasure to take part in the Asia-Pacific Housing Forum, the sixth one, hosted by Habitat for Humanity. It has been over five years since I last attended a Habitat for Humanity function on its campaign to improve the stilt houses in the fishing village of Tai O on Lantau Island, also upon the invitation of Darwin (Dr Darwin Chen), Honorary Chairman of Habitat for Humanity Hong Kong. As some of you may know, Darwin is a former government colleague who has never given up serving Hong Kong since retiring from the civil service almost two decades ago. His passion and commitment to Hong Kong are simply admirable. Indeed, passion and commitment, plus what I call empathy, are what I regard as the essential virtues of a public servant. As housing is a top priority of this term of the Hong Kong Special Administrative Region Government, and experts and professionals are gathering here together in this Forum to seek better solutions to housing issues, let me just illustrate how my Government's policy towards housing is to be driven by passion, commitment and empathy. First of all, housing has always been one of the most important livelihood issues in many societies, especially in a place like Hong Kong, where land supply is constrained whereas demand is abundant because of our being an international financial, trade and investment centre. Our housing policies have evolved over the past six decades. While much has been achieved, it is still an issue that we are struggling with. Opinion polls conducted from time to time highlight that this is the number one problem that our people want the Government to address. From a governance point of view, suitable or decent housing for all is widely recognised as the foundation for a stable society. Let me start with some basic figures on the housing landscape in Hong Kong. Out of the 2.5 million households in Hong Kong, 46 per cent, that is 1.16 million households, live in public housing and 54 per cent, that is 1.35 million households, in private housing. Of the 46 per cent in public housing, 31 per cent are in public rental housing, or PRH in short, while 15 per cent are in subsidised sale flats, or SSF in short, that is, self-owned units acquired with government subsidies. In terms of ownership, about half of our households are living in owned properties. There are two main types of public or government assisted housing in Hong Kong - that is PRH and SSF. Based on the prevailing eligibility requirements, a four-person household earning less than HK$27,050 a month is eligible for PRH, whereas a four-person household with monthly income up to HK$52,000 is eligible for an SSF. This income limit of HK$52,000 is actually close to the income of the top 20 per cent of all households in Hong Kong. Beyond those prescribed income limits, and of course we also have asset limits, families would have to look to the private housing market to meet their housing needs or home ownership aspirations. Public rental housing is the first step on the housing ladder. It is the primary housing solution for low-income families who cannot afford private rental housing. PRH is mainly provided by the Hong Kong Housing Authority. It is a statutory body established in April 1973 and a key partner of the Government in providing and managing the vast majority of the public housing flats. There is a persistently strong demand for PRH. As at end-June 2017, there are 150 200 general applications and 127 600 non-elderly one-person applicants on the waiting list. That is, in total those two, close to 280 000. The average waiting time for general applicants is 4.7 years, falling behind the Housing Authority's commitment of providing the first flat offer at about three years on average. The Housing Authority now has a total PRH stock of some 800 000 units. Many of these PRH tenants have over the years increased their income or accumulated wealth to move up the housing ladder. To meet their home ownership aspirations, we have resumed the Home Ownership Scheme and are selling flats at a discount of market value to the more well-off PRH tenants as well as non-PRH eligible families. We have also introduced a pilot project of selling subsidised flats exclusively to PRH tenants, the so-called Green Form Subsidised Home Ownership Scheme. All these sales were all heavily oversubscribed, clearly proving the demand for home ownership. Driven by a passion to better meet our population's housing needs and aspirations, in light of the surge in property prices which are now at their historic high, recording an increase of 20 per cent year-on-year, I have promised in my Election Manifesto to enhance the housing ladder with a focus on home ownership. Practically, this would mean (a) increasing the supply of flats under the Green Form Subsidised Home Ownership Scheme to allow and induce PRH tenants with sufficient means to become home owners, thereby also vacating their PRH units for others on the waiting list, many of whom are living in poor housing conditions; and (b) introducing a new form of subsidised sale flat called "Starter Homes" for Hong Kong permanent residents aspiring to buy their first flat but whose income exceeds that applicable to the Home Ownership Scheme and who are finding private housing prohibitively expensive, and this will reignite their dream to afford a home in Hong Kong. These ideas of mine to rebuild a housing ladder are not entirely novel: it is integral to the Long Term Housing Strategy which the Government promulgated in December 2014 after going through an extensive and elaborate public engagement process including a three-month public consultation. Indeed, the Long Term Housing Strategy has advocated a supply-led approach which requires that we anticipate housing demand and plan ahead for land supply so as to allow time for public housing construction and making land available for private housing development. To adhere to a supply-led approach, the Government has to commit to a long-term programme in land supply. Planning studies and projects to create land for housing development should not be affected by economic cycles or fluctuations of the property market. However, building a land reserve for Hong Kong, very often, is easier said than done. Our major challenge lies in the acute shortage of what I call "developable" land in Hong Kong. In the last two terms of governments, efforts have been made to expand land resources through a multi-pronged approach. In 2011, the Development Bureau I then headed launched a public engagement on enhancing land supply strategy. We undertook studies on the use of underground space and the development of rock caverns as well as reclamation outside the Victoria Harbour in order to help build up a land reserve. That was almost six years ago, and where are we now on reclamation? Very little progress. Having been involved in some of these exercises, I have come to the view that Hong Kong is not short of land, or the options to provide more land. What is lacking is a broad consensus on where the land should come from. Thus, in my Election Manifesto, in the land supply chapter, "seeking consensus" comes before any short-term or medium-term and long-term measures to find land. I said to find more land to tackle the housing problem, we must draw on the collective wisdom of society and recognise the need for compromises and give-and-take in order to find a solution that benefits the community as a whole. To help us build this community consensus, I appointed a Task Force on Land Supply last week, which is actually going to have its first meeting this afternoon, to take a macro review of our land supply options, and to try to build community consensus through rational debate in society. I am confident that the 30-member-strong Task Force comprising 22 non-official members from relevant professions, think tanks and community organisations can help us map out the way forward. Let me assure you that there is no shortage of commitment and courage on the part of the Government to tackle this long-standing concern of our population. At the introductory paragraph to my Manifesto, I said I come from a grass-roots family and did my homework on a bunk bed when I was a student. So when Jonathan (Chief Executive Officer of Habitat for Humanity, Mr Jonathan Reckford) mentioned that many policymakers do not know exactly the housing conditions or the standard when they devise policy, I count myself as an exception. As a result of the housing and land shortage, thousands of young children in Hong Kong are now living in what we call sub-divided flats and like me have to do their homework on their bed. Others are living in converted units in industrial buildings which carry fire risks. That strong sense of empathy has urged me to find early solutions, in the same way that the previous generations have made tremendous efforts in developing Hong Kong and provided me with many opportunities. We, as a government and a generation, must not let our younger generation down. 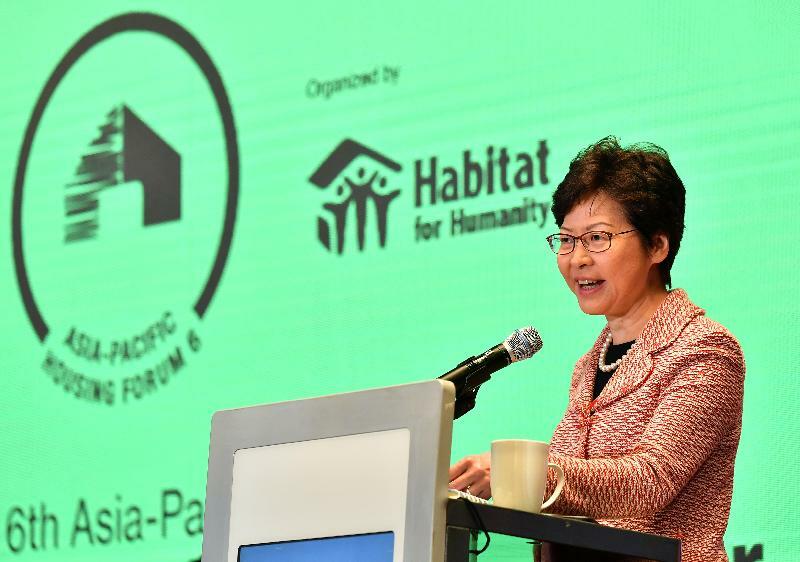 Before I conclude my speech, may I take this opportunity to thank Habitat for Humanity for choosing Hong Kong as the venue for hosting this event. And let me not forget the 600 million children that Rick (Vice President for Asia and Pacific of Habitat for Humanity, Mr Rick Hathaway) mentioned living in poor conditions in the Asia-Pacific region and the several, many thousands of children in Hong Kong living in these sub-divided flats as we find compromises and solutions to the housing problem. I agree entirely with what Jonathan said - we have to make the invisible undeniable. So one of the first questions I am going to put to the Task Force this afternoon is ask society, when we have thousands of children living in those appalling living conditions, can we not really do some reclamation outside the Victoria Harbour? Can we not really explore using some of the margins of the country parks? Can we not enhance our efforts in resuming land and clearing some of the cottage areas in the rural NT to provide decent housing? These are questions that we all must answer. We look forward to sharing some of the innovative solutions that will emerge from discussions at the Forum. I wish you all a wonderful event and a very nice stay in Hong Kong.